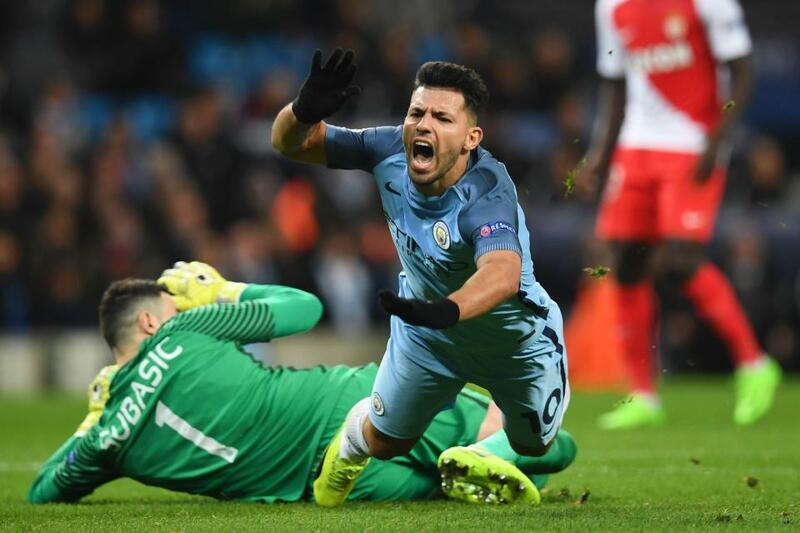 Manchester City played out a drab, uninspired and uneventful 0-0 Champions League stalemate with Monaco, at a sparsely populated ‘Emptiad’ Stadium last night! 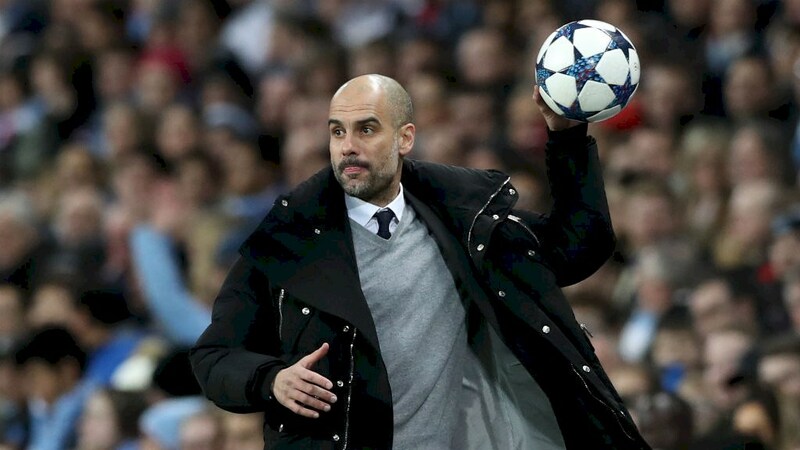 Having a ball – Pep Guardiola saw his side win a 5-3 thriller against Monaco. Do you know what, I think I’m getting the hang of this ‘Fake News’ and ‘alternative facts’ malarkey! Move aside Kellyanne Conway, I’m on my way to the White House and a new career in trumping up distortion overload on behalf of Donald and his cronies. That said, a record Champions League attendance of 53,351 could hardly believe what they were watching, as City and the men from Monte Carlo produced a pulsating 5-3 thriller that will live long in the memory. 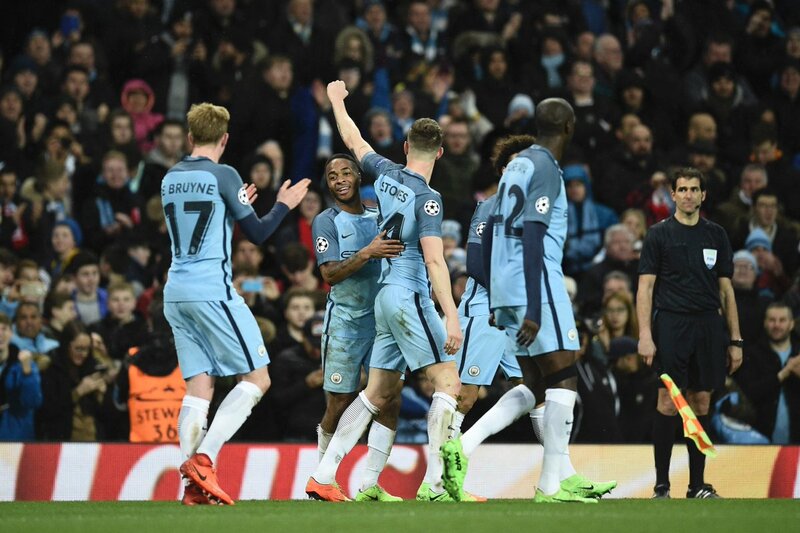 Celebrate – City’s players experienced a rollercoaster of emotions in a 5-3 humdinger against AS Monaco. Pep Guardiola’s men twice came from behind in a Round of 16, 1st leg humdinger, one which ranks as City’s most remarkable in their six years of competing in Europe’s top club competition. Having scored 76 in just 26 Ligue 1 fixtures this season, much had been made of Monaco’s goal threat. Colombia’s finest – Falcao produced a sublime finish to put Monaco 3-2 up. When a ‘reborn’ Radamel Falcao restored the French side’s lead for a second time on the night, making it 3-2, it began to look like Mission Improbable, if not quite Impossible, for City. Raheem Sterling and Sergio Aguero had twice netted for the hosts to lead 1-0 and then pull it back to 2-2, but City were in need of something special. Sterling effort – Raheem has now contributed 5 goals and 5 assists in his last 9 Champions League games for City. In keeping with their manager’s approach to the beautiful game, Sterling, Aguero (twice), Stones and Sane weighed in with the goals, to cap a sublime showing and take a two goal advantage to Monaco on March 15th. 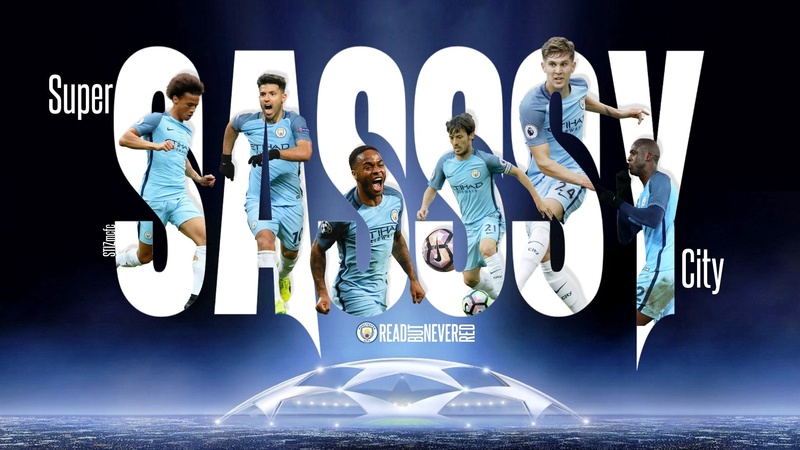 City’s elongated version of the SAS elite military force – Sterling, Aguero, Sane, Stones and Silva (SASSS) – took on a SASSSY appearance, as Yaya Toure’s renaissance in Sky Blue continued. Super SASSSY City – another great bespoke graphic created by Stiz from our BlueRoom sponsors. The Ivorian colossus has been instrumental in stabilising City’s fortunes since returning to the first team fold in late November. Omitted from City’s CL squad for the group stages, Yaya has acclimatised to a deep lying role in front of the defence, bringing bags of experience and an unflappable air to proceedings. Whereas youngsters, Leroy Sane and Sterling have been hogging the flanks – and the headlines – as Pep’s speedsters on the wings, Sergio Aguero has been the subject of unwelcome speculation about his City future. Sane & Sergio – two vital components of City’s SAS. Sergio – one of City’s favourite sons – was clearly a man with several points to prove, as he produced an indefatigable personal effort, within the framework of a mesmerising attacking performance. His brace in the 58th and 71st minutes, set the platform for John Stones and Sane’s goals in the 77th and 82nd minutes, as City finally quelled a Monaco team fizzing with offensive threat, but defensively as solid as a Camembert cheese left out in a sizzling sun. On the volley – Sergio fires home City’s equaliser to make it 3-3. At one point Aguero was dispossessed in midfield before running back 20 yards to hustle and battle to regain possession, much to the delight of a watching Guardiola. Pep has been demanding more and more of City talismanic striker and here was Sergio delivering, goals, assists, tackles, tracking back, as well as being denied another ‘stonewall’ City penalty. Don’t touch it – Raheem avoids contact with the ball as Leroy steers home City’s fifth goal. How often have we seen that this season? Spanish referee Antonio Miguel Mateu Lahoz (his parents had never heard of abbreviation) added insult to injury, booking Aguero for diving. Stonewall City penalty…but not given as per usual! It led to some City fans brushing up their linguistic skills and discovering the word ‘gilipollas’, as in the terrace chant ‘The referee’s a gilipollas…’ repeat to fade. 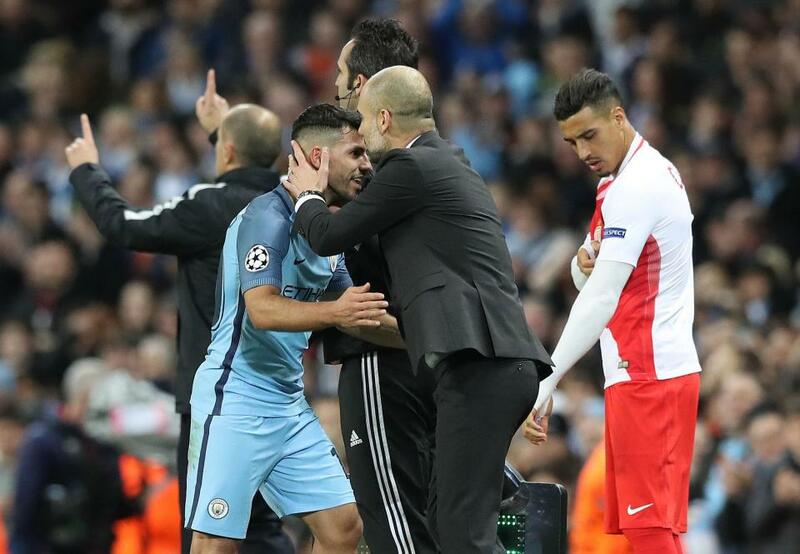 Aguero was substituted four minutes from time to a standing ovation and a kiss on the top of his head from Pep. Give us a kiss – Blue Bromance for Pep and Sergio. One can only hope the madness of selling Sergio is just that – utter madness – which will not come to pass until 2020 at the earliest. 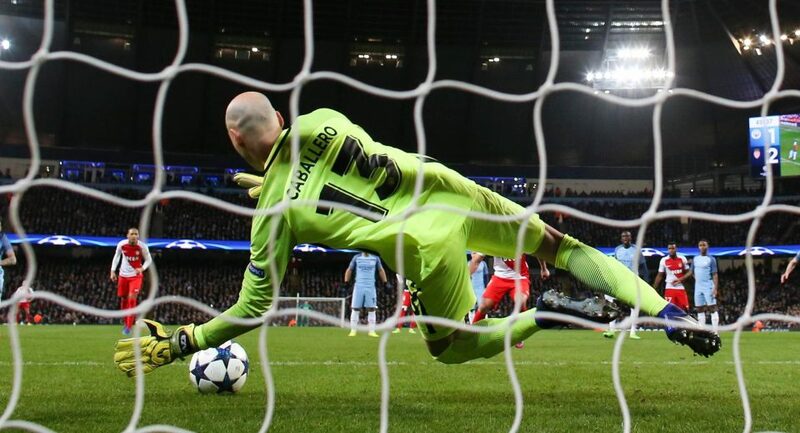 Fellow Argentine Willy Caballero, clearly established as City’s No 1 ahead of Claudio Bravo, produced another memorable penalty save, denying Falcao what could have been a game-changing 3-1 Monaco lead. Willy does the business again – City’s new No 1 goalkeeper saved Falcao’s penalty. Big Willy, and the now departed Joe Hart, have combined to save the last five penalties awarded against City in the Champions League. Memo to Pep – Don’t fear the prospect of any penalty shootouts! Kevin De Bruyne and David Silva supplied masses of munitions to City’s SAS strike corp as City positively purred when in pro-active mode. The polar opposite was true of a porous backline which adopted a defensive stance displaying schoolboy type errors. 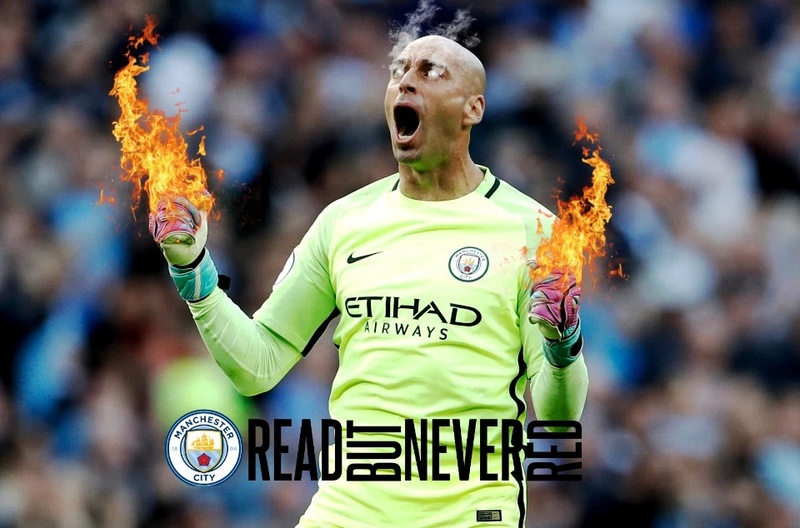 Hands of Fire – Willy Caballero is red hot when it comes to stopping shots from the penalty spot. Image courtesy of Stiz from the BlueRoom. Nicolas Otamendi’s positional play and spatial awareness were horribly AWOL on numerous occasions. Pep gave him a proverbial b*ll*cking – sorry pitch-side advice – on one notable occasion. If rumoured interest from Real Madrid in ‘Otto’ develops this summer there is surely a deal to be done for this particular Argentinian Blue – either in a player exchange or hard cash. Stones Salute – John Stones celebrates his vital goal, giving City a 4-3 lead. In fairness, Otamendi wasn’t alone on a night of Keystone Cop defending from both sides, with a plethora of faux pas adding to the evening’s hysteria and excitement. Lovely sentiments Joe – but NOT when away goals count double! 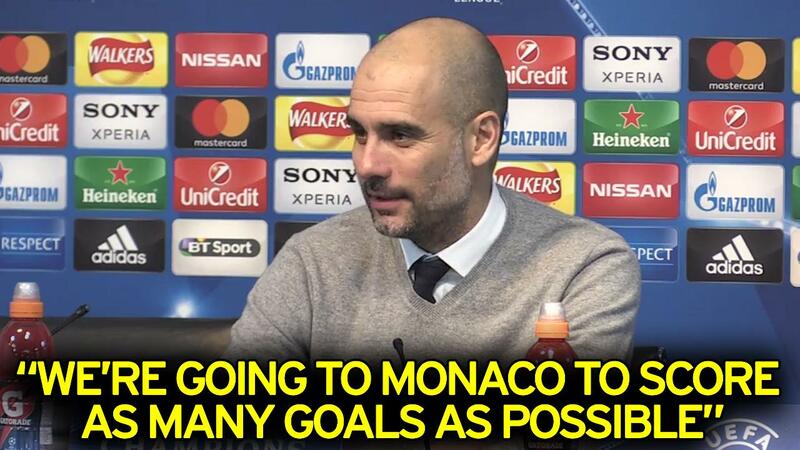 Mission Monaco – score as many goals as possible says Pep – Simples! Pep has already said he believes City will have to score in the Stade Louis II on March 15th if they are to preserve their 1st leg advantage and advance to the Champions League Quarter Finals. With such an array of attacking riches on display only a fool would forecast a 0-0 draw in the second leg. 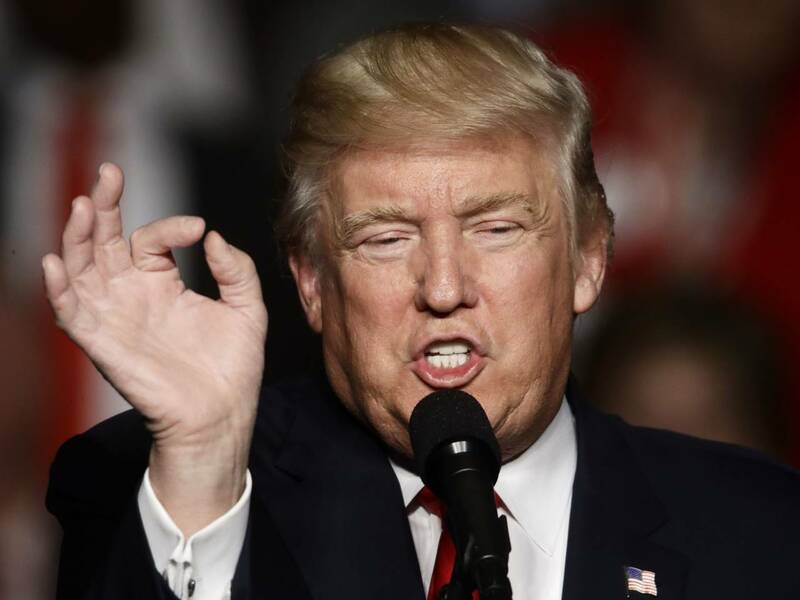 So Mr President, how many goals will City and Monaco score in the 2nd Leg? Sorry Donald, what’s that…it’ll be scoreless in Monaco in mid-March – oh, okay, whatever you say Mr President! Lifetime City fan Mark McCarthy is hosting an evening with former City and England striker David White on February 25th, to promote the release of David’s powerful new autobiography ‘Shades of Blue’…and Read But Never Red will have a personally signed copy of David’s book to give away to one lucky RBNR reader. 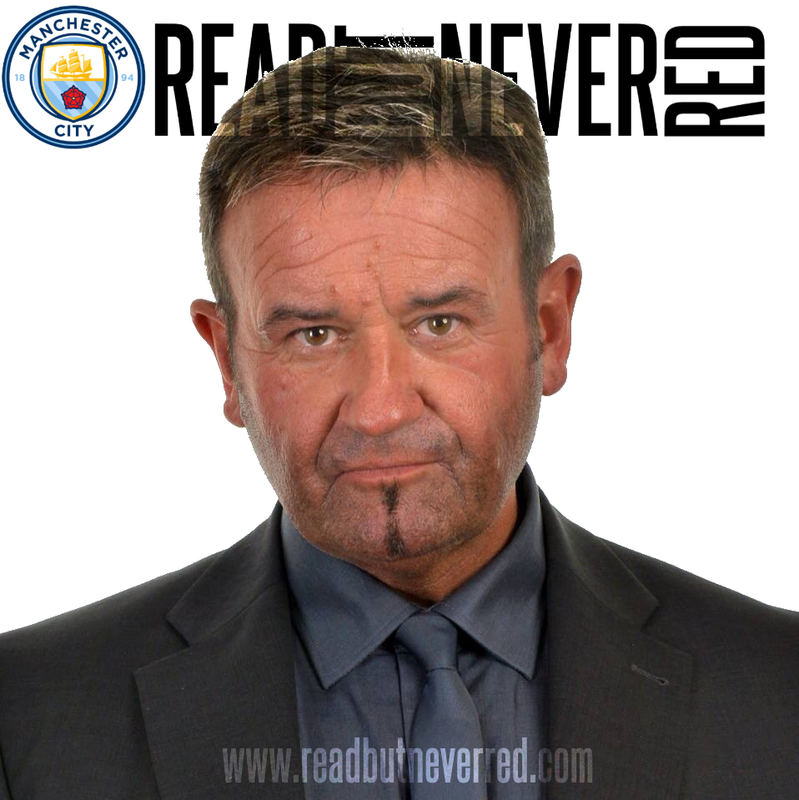 Shades of Blue by David White – Read But Never Red has a signed copy of ‘Whitey’s’ new book to give away. All you have to do is tell us what year was David White born? Send your answers via the Comments section at www.readbutneverred.com or via our Facebook page or on Twitter @ReadButNeverRed using #ShadesOfBlue and the year in question. The winner will be contacted via social media and the signed copy of the book dispatched after February 25th. David White will be fielding questions and giving answers at a Q&A evening and book signing at 7pm at Newport Pagnall Town Football & Social Club, The Pavilion, Willen, Newport Pagnall, MK16 0DF. Tickets are FREE but limited in number, so please don’t delay and contact Mark directly on mmmac@hotmail.co.uk if you wish to attend. David White was born in Manchester in 1967 with football flowing in his veins. Driven by his football-mad dad, David’s prodigious talent was spotted early and he soon signed coveted schoolboy forms for Manchester City, the team that he’d supported since boyhood. A meteoric rise through the club’s ranks led to his first-team debut at the age of eighteen, and he continued to light up Maine Road’s right wing for the next eight years. It was a career that would take him to the heights of playing for his country. 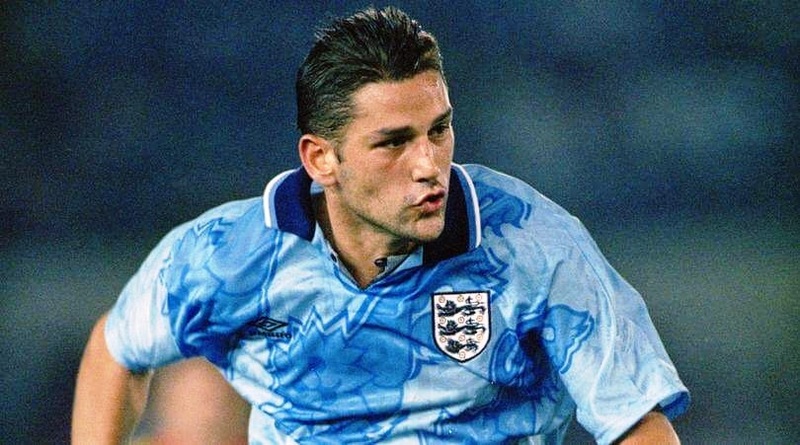 One of City’s favourite sons David White will be meeting fans for a Q&A session and book signing in Milton Keynes on February 25th. But David’s performance on the pitch was frequently blighted by a lack of confidence and consistency, traits that baffled his fans and family. Only David knew the real reason behind his struggles. Only David knew who had shot his confidence to pieces. Only David knew that, aged just eleven, he had been sexually abused by his football coach, Barry Bennell. 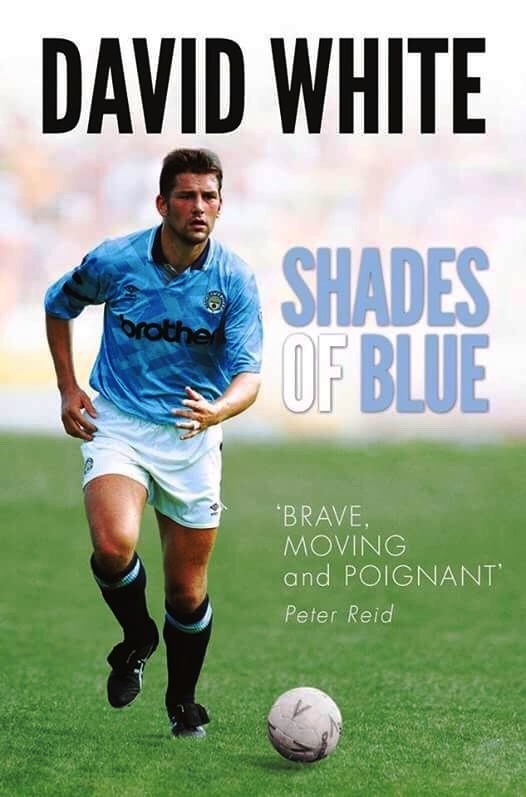 Shades of Blue tells the story of David’s extraordinary life: his passion for football, the drama of his games and his fight to outrun the shadow of that early abuse. Having spent years feeling that he had to conceal his secret in order to protect his father and his football career, it is only now that David has felt able to give a full and honest account of his life – one with a powerful message that aims to repair the damage at the very heart of the sport. Once a again a very good read....the officiating was nothing short of horrendous!! Cheers fella - yes the referee and his accomplices - sorry, assistants - were incredibly poor - I thought it was Lee Mason after a few sunbed sessions. On the bright side my Spanish linguistic skills have benefited from an enhanced vocabulary! It's cruel to dangle the carrot of meeting David White. Was my first, and will always be, my favourite City player. Currently halfway through his autobiography, it's been difficult (for obvious reasons) but also uplifting. Great man. No carrot dangling here CWK, if you can make it to Milton Keynes on Saturday 19.00 hrs it'll be All White on the Night - I can't believe I just wrote that ;-) Details on the blog, plus, although you already have a copy of Shades of Blue, you can win a signed and personalised edition via our competition. As ever, thanks for reading and commenting. I'd love to read your book David. And I presume your birthday was on the 30th October 1967, wasn't it? Those are the correct details and you're now entered into the RBNR competition to win a copy of Shades of Blue, signed by David White. As usual David, fair comments and humour. We all know the strengths and weaknesses, and the weaknesses will be sorted out in the Summer. Until then, am prepared to sit back and enjoy the ride, wherever that may take us - who knows it maybe Cardiff. And as usual, we're in agreement RC. Great to see you and Mrs C at Bournemouth, let's hope we have good reason to meet up in Cardiff in May! Oh what a night! Oh what a read! Thank you David. Oh wasn't it! As for the read - thanks for your generosity, always my pleasure if people like my MCFC musings. What a game watched it again last night just in case I had missed anything. I along with with everybody else watching went through every emotion known to man. If only we could defend like we attack what a team we would have, guess the return depends on who's defence is worse. Surely their is no question at all about Aguero staying at city their would be mutiny among us fans. Cracking article again David, I do believe your getting quite good at this lol. I now deal in FAKE NEWS! There could be a whole new career out there for me ;-) Thanks Doug. Completely with you on all sentiments expressed. All I would say is wait until Pep has the summer transfer window to sort the defence and watch us go in 2017 and beyond. I reckon we can win everything in sight with Snr Guardiola at the helm.